Ménière’s disease is of unknown cause and affects the inner ear, causing episodes in which the person feels as if they are spinning (vertigo), ringing in the ear (tinnitus) and fluctuating hearing loss – often with a progressive, ultimately permanent loss of hearing. Pat’s health condition is invisible. She has Ménière’s disease (MD) resulting in a progressive hearing loss. Initially it was mild on one side. But by her mid-30s, Pat was profoundly deaf in her left ear – and determined to keep it hidden. Eventually, when she was no longer able to cope using strategies such as making sure people were always on her right side, Pat began to acknowledge the hearing loss. Still, she refused the help of a hearing aid because of the stigma that would mean. In working hard to not be different, “mostly you’re bluffing, you’re pretending that you understand when you don’t,” Pat says. “For a while you can get away with it, or you think you can get away with it. Looking back, Pat remembers it getting to the point where she was struggling at work, in friendships, and avoiding going out. “It was all self-blame,” she says. “It was all a sense that I wasn’t trying hard enough. That if I were better at this, I wouldn’t have this problem. It was not, ‘Well, gee, people need to understand I’m struggling here.’ Because I didn’t feel that I could ask for help or understanding. I just thought people would negatively view me as inferior because I had a hearing loss. And it was up to me to do better. So while you’re busy trying to protect your self-esteem, you’re being put down for a different reason. Unable to interact with others in a “normal” way led communication partners to jump to the conclusion that Pat was rude, standoffish, not smart, and all the other assumptions. Because she was not behaving in a way people expect, those around her needed to make some sense of this and so they jumped to negative conclusions. He looked at her, puzzled since she normally wears contact lenses. “I suddenly realized because I can’t see your lips, I’m not hearing as much as I think I’m hearing,” Pat said. Without realizing it, she had become very adept at lip reading. 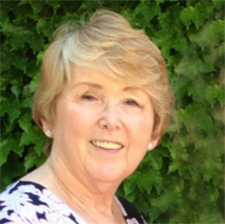 In the support group Pat helped start (a chapter of the Hearing Loss Association of America), she works as a hearing health advocate to help people better manage life with this invisible disability. There is also a lot of discussion regarding how much prejudice and stigma and just total discrimination there is in the workplace. Pat interacts with the world very differently now and clearly states what her needs are. “And the more I do that, the better my life is,” she says. “The better my relationships are. The better I function.